The daredevil pilot, while recounting the thrilling rescue operation, said that the "roof top low hover in a light on wheels" (technical name for rooftop landing) lasted around eight minutes before the chopper took off again. Three seconds. That is how long it would have taken for the Seaking helicopter, which made a dramatic rooftop landing in Kerala to rescue 26 people, to disintegrate into pieces had anything gone wrong. "I had to take a decision to go in for the 'light on wheels' procedure where the entire weight of the helicopter is not on the roof as it may have caved in," Lt Commander Abhijeet Garud said. The video of the daring rescue operation by the Navy's Seaking 42B helicopter at the flood-ravaged Chalakudy town in Kerala on Friday has gone viral on social media and garnered thousands of 'hits'. Having winched four people, lifting another 22 was a major task and the crew took a call of going for a low hover to embark all those stranded there, he said. Asked what if something had gone wrong, the 33 year old pilot said, "It would have taken three to four seconds for the chopper to disintegrate. It was a tough call to make. I am glad we made the right decision." "It was a classic case of the importance of good pilot judgement, or aeronautical decision-making," he said. 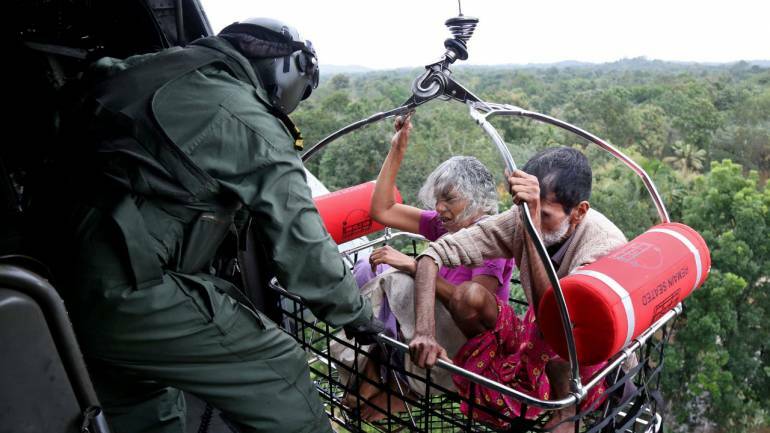 Those rescued, including an 80 year old man, were shifted along with some luggage from Chalakudy to the naval air base INS Garuda in Kochi. "The operation was possible due to the teamwork and excellent coordination among the crew. It included Lt Cdr Rajneesh (co-pilot), Lt Satyarth (navigator), Ajit (winch operator) and Rajan (free diver)," the pilot said. When the chopper first took off in the morning, the sortie was planned for dropping two Gemini boats with eight divers in Chalakuddy, he said. "After dropping (the payload) we started rescuing people and distributing food and relief material. On one of the ground-plus-two storey houses we saw aged people and women waving. Prioritising them (we) proceeded for a pick up," he said. "Many people came out thereafter. We saw almost 20 to 25 people, including a woman on wheelchair. She was unable to board the 'basket' sent for winching her up," said Lt Cdr Garud, an alumnus of the Naval Academy in Kerala.